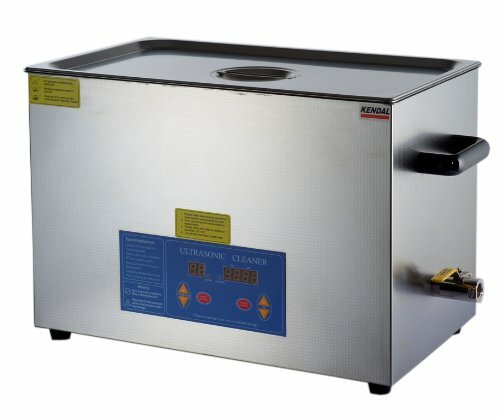 This Large Commercial Grade Ultrasonic Cleaner has 8 Sets of Powerful Ultrasonic Transducers; Cleaning Power: 480 Watts Heater Power: 300 Watts; Tank Size: 19.5" (L) x 12" (W) x 6" (H); Tank Volume:21 Liters (5.55 gallon); With Timer and Temperature Controller; Whole Body in Stainless Steel --Anti-Acid and Alkaline; Drains with Flow Control Valve for Easy Cleaning and Rinsing; Safe and Efficient Heater - Enhance Cleaning; Special Design - Suitable for Various Industrial Environment. 8 x strengthened transducers make the ultrasonic more powerful (42 KHz and 480 Watts ultrasonic cleaning power) and provides remarkable cleaning results. Large tank -- Suitable for long and large items. Tank Size: 19.5" (L) x 12" (W) x 6" (H). Tank working Capacity: 21 Liter (5.55 gallon). Heater -- Powerful heater (300 watts) makes the temperature reach the presetting one quickly -- significantly enhance cleaning. Digital program cleaning cycles ranging from 1 to 99 minutes--easy to operate. Digital temperature control with temperature ranging from 20 to 80 degree in Celsius (68 to 176 degree Fahrenheit). Drains with flow control valve for easy cleaning and rinsing. Power Supply: AC 100-120V 60 HZ. If you have any questions about this product by Kendal, contact us by completing and submitting the form below. If you are looking for a specif part number, please include it with your message.